AAATalks / Go Magazine / Carolinas / Three Cheers for the Beard! Beards are big these days. There are even clubs, associations, societies and competitions built around them. In Charleston, South Carolina, The Holy City Beard and Mustache Society holds get togethers and an annual competition for the facially hirsute and I — a beard wearer of 22 years — talked to their president, Aaron Johnston, about facial follicles, competitions and the brotherhood of beards. Johnston, an industrial x-ray technician, won first place in the natural goatee category in the 2017 World Beard and Mustache Association Championships and runner-up in the 2018 Great American Beard & Mustache Championship. 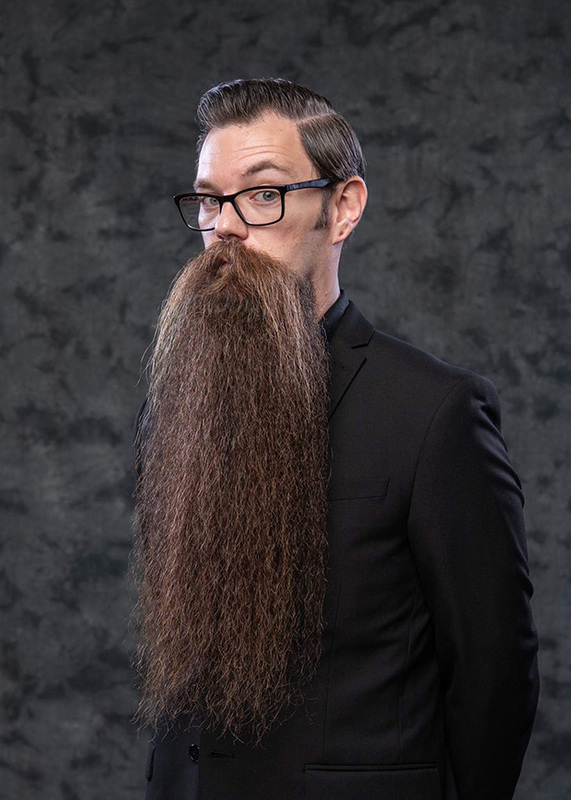 His goatee is a whopping 22 inches long and because of it, he’s been a judge in beard competitions as far away as the United Kingdom and as close to home as Wilmington, North Carolina. These aren’t bearded ladies. 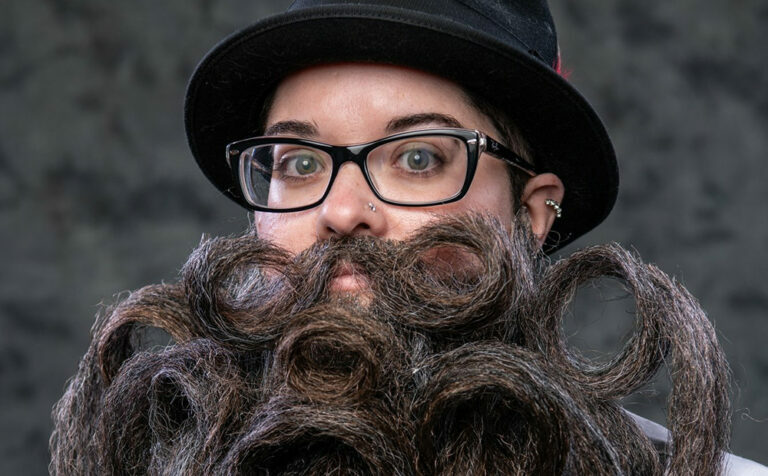 Rather, ladies compete in creative beard — they create a “beard” from anything they like, the bigger and weirder the better — and natural beard — where the face wig the ladies don is made to resemble, as closely as possible, a real beard. And Johnston knows what he’s talking about: his wife, Natalie, is both the U.S. National and British National Realistic Beard champion (pictured above). For the fellows, categories include goatees — natural and Musketeer (narrow, pointed beard; long, slender mustache that points to the side); full beard – natural, natural with a styled mustache, the rounded Verdi and the Garibaldi; and mustaches — natural, Dali, the big and bushy Hungarian. Entries in these categories range in length and lushness and, with the exception of being very long or very thick, are recognizable as beards and mustaches. But the freestyle categories are where it gets interesting. Here, entrants use styling products to create swirls and swoops, points and peaks, even intricate designs with their beards and mustaches. “As a judge, you look for how the beard fits the category — is it full, long enough, the right shape — and then you look at the total presentation. If two identical beards are up against one another, but one fellow has on flip flops and a T-shirt and the other is wearing a suit, the suit wins every time,” says Johnston. Judging is a key part of the competitions, and these beards are full-time commitments. So, you can imagine competitors receive odd looks on a daily basis. A judging eye fell on the founder of the Holy City Beard and Mustache Society, Dr. Paul Roof, a.k.a. The Beer Can Professor. His spectacular, pointy, swooping freestyle beard was judged worthy of becoming the label art on a can of Holy City Beer, which didn’t sit well with his employer. Every Memorial Day, The Holy City Beard and Mustache Society holds a charity competition. They’ve given away more than $50,000 to Lowcountry organizations, including $8,000 to Big Brothers Big Sisters of Carolina Youth Development Center in 2017. There’s more! Read “Your Weekend Guide to Charleston, S.C.” for more Charleston area diversions!